Buckle up for the funniest, naughtiest and coolest series you'll ever read! They look like the Bad Guys, they sound like the Bad Guys ...and they even smell like the Bad Guys. But Mr Wolf, Mr Piranha, Mr Snake and Mr Shark are about to change all of that - whether you want them t... read full description below. Buckle up for the funniest, naughtiest and coolest series you'll ever read! They look like the Bad Guys, they sound like the Bad Guys ...and they even smell like the Bad Guys. But Mr Wolf, Mr Piranha, Mr Snake and Mr Shark are about to change all of that - whether you want them to or not! Will Mr Wolf's daring , dangerous plans give the Bad Guys a much-needed image makeover? Will Mr Snake stop swallowing things he shouldn't? An who is that mysterious figure watching them from the shadows? 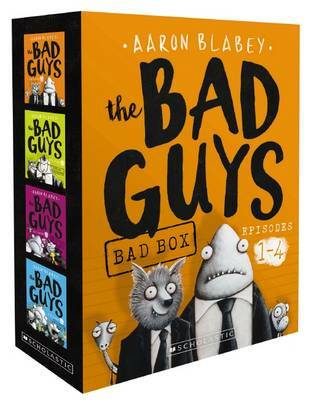 Get ready for sidesplitting adventure in The Bad Guys: Bad Box of Episodes 1-4, from best-selling author Aaron Blabey!